Goolara Symphonie now supports the ability to create and add barcodes to email from within the software. 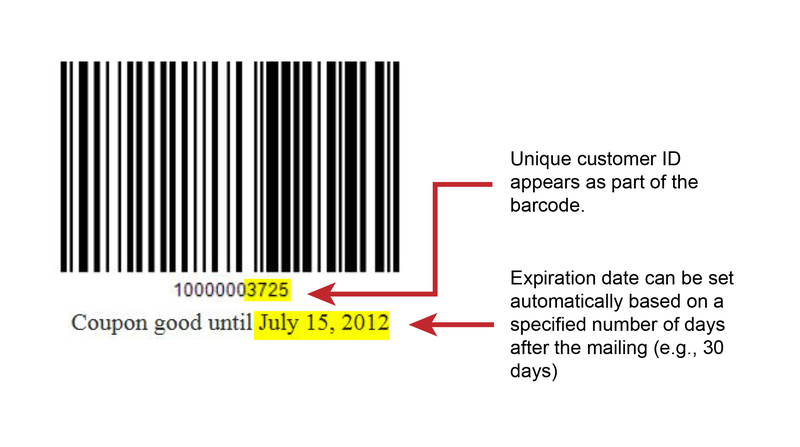 If you need to generate coupons, passes, or other barcoded email, now you can do this without ever leaving Symphonie. But that’s only the tip of iceberg. Symphonie also lets you create dynamic barcodes. Using a recipient’s demographics, you can create tailor-made barcodes that contain a customer’s vital statistics or other unique information, helping you control the use of the coupons you send out. We may add additional choices to the list from time to time if there are other codes that prove to be popular. There are three ways to segment email campaigns: per customer, by pool, or with a limited data range. Here are some ideas for using these features. Customers with robust POS systems can take full advantage of dynamic barcodes, assigning a unique code to each customer. This code may contain any of the demographics about a recipient, and is a great way to keep track of coupon usage and to compare current and past shopping patterns. It also makes it easier to control the use of the coupons in situations where online copying might by unwanted. Once the customer uses the coupon, that information goes into your system, providing plenty of additional information about the customer and their purchasing habits, allowing you to further refine your marketing strategy. If your POS system cannot handle that much information, there are a simpler alternative uses for the dynamic barcode feature that are also quite powerful. Individually numbered barcodes are a useful addition to codes that don’t contain specific customer information. After the coupons are used the barcode numbers are paired up with specific customers. This is easily accomplished and we can work with you to facilitate this solution as well. We will use the number range you specify and send a list that identifies which customer received which number. In this way, even basic POS systems can compete with more advanced systems when it comes to identifying customer buying patterns. As long a system can keep track of one variable number, we can provide the rest. Please call for more information. If you’ve used barcodes already, then you know what a valuable tool they are for marketing and sales purposes. If you are new to barcodes, Wikipedia has a good explanation of what they are and how they work; also please download the latest version of the user manual, or contact us for more information. For more information on Dynamic Barcodes, click here. For more information on Goolara Symphonie, click here. For more information on Dynamic Content, click here. This entry was posted in Dynamic Content, Email marketing, Symphonie and tagged barcode, Code 128, coupons, DataMatrix, demographics, QR Code, scan, UPC, variable content on May 14, 2012 by Jim Morton.